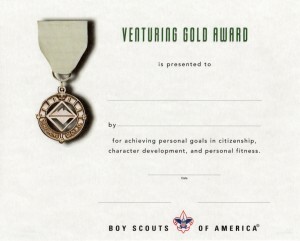 The Venturing Gold Award was developed to recognize the significant accomplishment in a Venturer’s life as he or she has proven outstanding performance in a broad spectrum of activities. Earning it will challenge and motivate Venturers over an extended period. 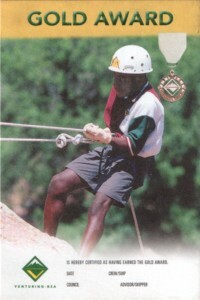 The candidate must have at least 12 months’ tenure as an active, registered Venturer before final qualification. b. 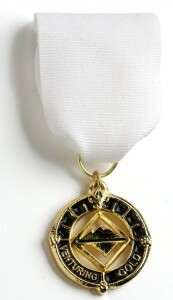 A team leaders’ council member or committee member. c. An activities chairman for one of the crew’s two-day activities or superactivity. After completing all other requirements, the candidate should prepare evidence of completion of the work and submit it to the crew Advisor. The crew president, in conjunction with the crew Advisor, should then appoint a review committee of four to six people including Venturers and adults. The committee should review the candidate’s written presentation and interview the candidate to determine whether that person grew as a result of the pursuit of the Gold Award. (Presentation orally and in writing is made before the Venturing crew review committee).2 No district or council review board is required.